The Cornrower was developed by Jim Straeter at New Holland Rochester, located in Rochester, Indiana. The unit is an attachment that fits easily on a New Holland 99C and 980CR chopping corn head and has been tested and approved to be used on New Holland CR combines equipped with the high-speed header drive. The Cornrower is manufactured by Craig Welding of Mentone, Indiana, using the latest in manufacturing methods and standards. Easy to understand and operate, the combine operator will hardly know it’s on the machine! Tests show less than 3 gallons of fuel per hour used above standard non-chopping corn head in side by side comparison at 4mph harvest speed with 8 row header! Grain quality, loss rate and other functions are not impacted at all by the Cornrower! To de-couple the stover harvest from the grain harvest, speed drying time, and eliminate the chopping/windrowing trips over the field, you need to look no further than the Cornrower! Uniform depositing of stalk material in the windrow with husks and cob on top is only possible with the Cornrower! Unloading on-the-go, maneuvering around obstacles, opening fields, etc. are not hindered by the Cornrower! 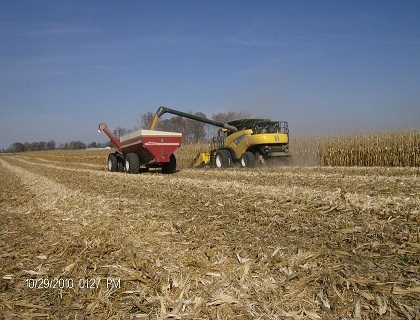 Cornrower chops the stover as it delivers the material to the windrow. 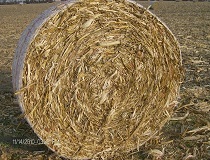 The result is a very baler-friendly material length that packs easily and feeds uniformly. Short stubble cleanly cut off is much easier on pickup too! High-energy cobs and husks are placed on top of the windrow so the baler easily takes this valuable material into the bale – all with no dirt or rocks to spoil your stover! Chopped stover mixes in TMR much better than conventional stover! Cattle prefer the clean, chopped Cornrower stover! Field tests show that baler intake rate, bale density, and bale shape are all improved over conventional chopping/raking or shredder/windrow systems. When you see how easy it is to incorporate stover harvest with grain harvest, you will see why operators are excited about the Cornrower. No other system offers less intrusion on the high-pressure harvest routine than the Cornrower. 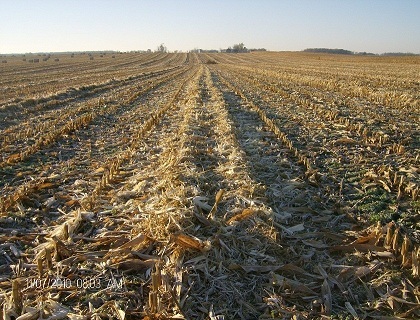 If you can shell corn, you can windrow stover!